Ellington Realty Group is proud to have worked together with these great folks in the lease for this fantastic new pizza joint near Brevard Road. Make sure to go, and check out the gorgeous handcrafted bar top while you’re there. Galactic Pizza, one of West Asheville’s newest restaurants, has a solid West Asheville pedigree. Owners are Jonathan Robinson, part owner of The Admiral, and Natalia Robinson, of Tastee Diner. Other owners are Sabrina White and Tim McMurrin, owners of Desoto Lounge, and Doug Ellington, who owns the Sardis Road building that Galactic Pizza is in. 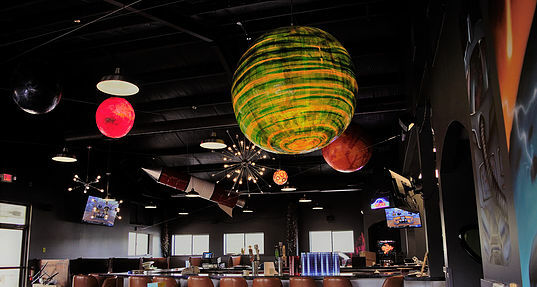 Galactic Pizza opened Thursday, Oct. 25, serving New York-style pizza with a crust made from cake yeast, which gives it a moistness that dry yeast doesn’t, Jonathan Robinson says. The restaurant will offer standard toppings, but also homemade vegan pepperoni and cheese. The chicken banh mi pizza was a big hit during the soft opening in late October, he says. Galactic Pizza is at 339 Sardis Road. Hours are 11 a.m.-11 p.m. Sunday through Thursday and 11 a.m.-midnight Friday and Saturday.